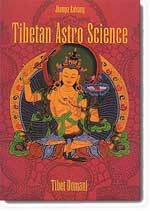 Tibetan Astro Science is an ancient science for promoting mental and physical health & happiness. It is based on the teaching of the Lord Buddha, in the year 1027 A.D. called the ShriKalachakratantra. The nicknames in Tibetan are skar-rtsis or star mathematics and byung-rtsis or elmental astrology. The overall aim of Tibetan astrology and astronomy, like modern sciences is to understand the cosmos, how it operates and how we can benefit from its forces and transitions, in order to live in union with the constant changes and movements of which we are an intergral part. 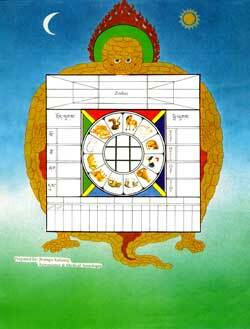 Traditional Tibetan Astrological Readings are an informative guideline of your future possibilities and obstacles. It provides information about relationships, partnerships, business, career, health, talents, spirituality and past, present & possible future events. Inclusive with the readings I offer counsel and recommendations for appropriate courses of action or antidotes to alleviate or remove specific obstacles where appropriate. These readings are audio taped and sent to you along with a copy of your Tibetan Astrological Chart. You may phone with any follow-up questions after you have listened to your reading. Looks at health, financial, relationship issues for whole life based on planets and elements. Comprehensive view. This explains the balance of the elements in the present moment of your life chart. Better to have Birth Chart first. This checks the elements of your year.